Sweet potatoes are a great source of Vitamin A and dietary fibre, which is good for weight control. Butternut squash contains Vitamin B-6, which boosts your metabolism and your energy levels. Spinach is high in niacin, which improves your cholesterol and boosts brain functions. It’s always good to know when you’re cooking how good the food will be for your body! I started off by roasting the quartered sweet potatoes and butternut squash. Keep the squash seeds for later! I did this by tossing them in oil, salt (I’m too broke for pepper) and chilli powder, before putting them in a 190-degree Celsius oven for 45 minutes. This gave them a beautiful softness and added a depth of flavour to the soup. After that, I fried up onion and garlic with oil on a medium heat for about three minutes. I then added the spinach to them, letting that wilt in the pan for another three minutes. 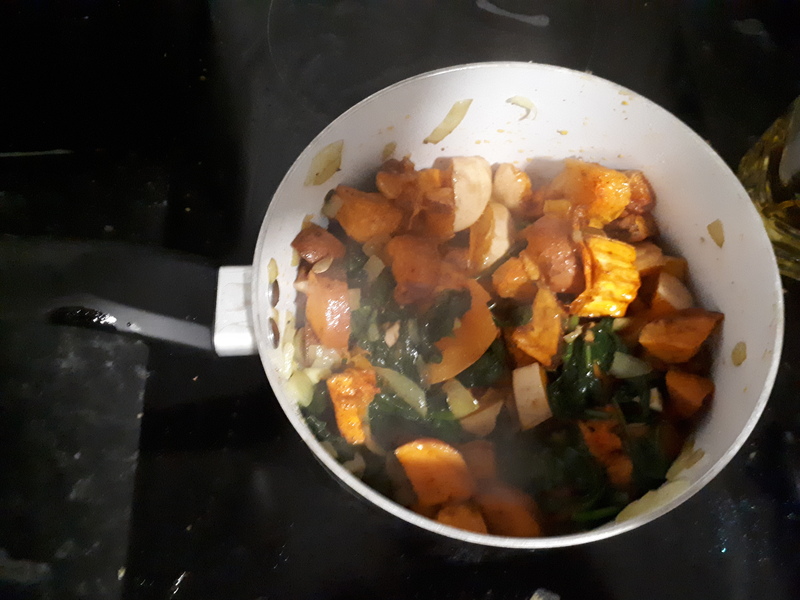 Whilst I did that, I boiled water for the stock cube and stirred in the sweet potato and butternut squash into the pan. Once I had stirred the stock cube and water together with a fork, I poured it into the pan and turned up the heat, to bring the soup to a boil. After that, I popped the lid on and put it on a low heat for 20 minutes. Whilst the soup was bubbling, I roasted the squash seeds with oil, salt and chilli powder (yes I’m a student with not much seasoning) at 190-degrees Celsius for ten minutes. The stock and the vegetables had now beautifully merged together to create a thick and fragrant mixture. 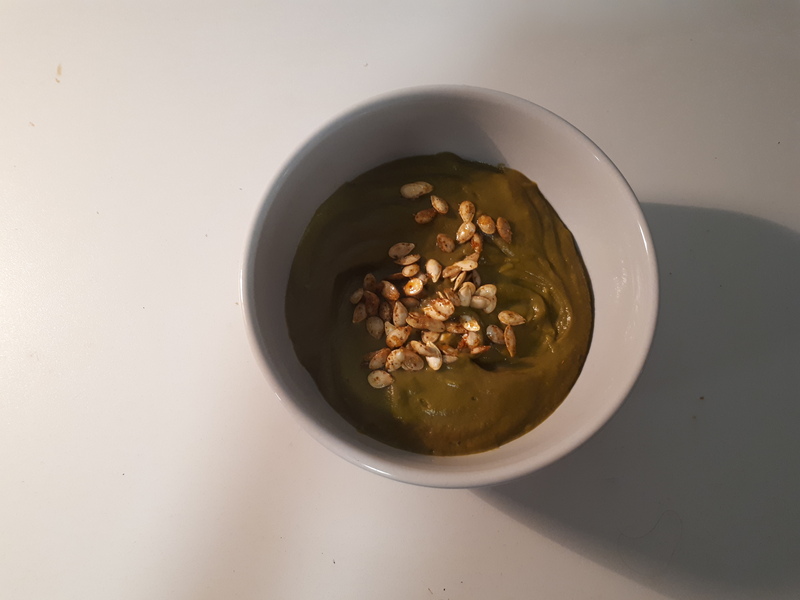 All of that went into my blender for 120 seconds and turned a mossy green colour from the spinach. I sprinkled the seeds on top and ta-da! Beautiful homemade soup. Made on a budget, with healthy ingredients, and loaded with flavour. Delicious! Will you be trying this out? Do you have any souper recipes of your own? Let me know in the comments!